Grunewald 10-String c. 1898 | SOLD | Rene Grunewald worked out of New Orleans, the Crescent City, and played a big part in the development of the 12-string guitar. At the tail end of the 19th century an inventor named Carl Brown held a patent for a 10-string guitar. Grunewald received license to manufacture a 10-string, and began doing so at least as early as 1897 according to a trade magazine of the period. The concept for the 10-string arrangement was to provide a guitar player access to octave strings in the first position, an idea that was touted as being 'mastered.. with a few days practice'. Instead of sliding the fretting hand position up the fingerboard, the player simply plucked the octave string. 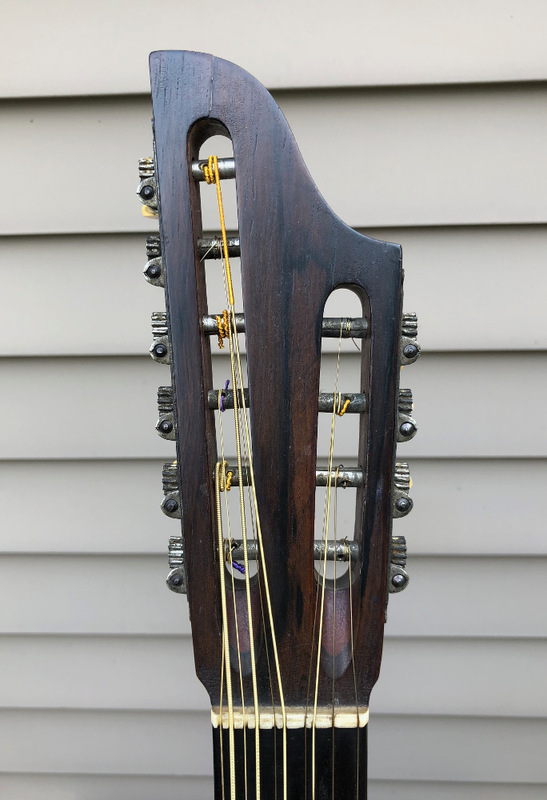 Very few Grunewald instruments of any type have survived, but the 10-string ...only manufactured for a few years as the 10-string morphed into the 12-string... is an extremely rare find today, and a true piece of guitar history. This example exhibits features comparable to the few other examples extant. The body is mahogany and finished in a faux rosewood. The top is spruce with inlaid herringbone trim, bound in holly. The neck appears to be cedar and sports a Brazilian rosewood overlay over its asymmetrical head stock. The bridge is ebony and is sculpted into a design unique to Grunewald's shop. The fingerboard appears to be ebony as well. The original tuners are engraved in a Grecian key pattern. The name 'Grunewald' is stamped inside a crescent (remember New Orleans nickname?) on the heel block, on the back strip and on the two top braces at the sound hole. Six of the nine bridge pins are replacements. The body measures 13" across the lower bout, and is a hefty 4" deep at the end pin. Scale length measures 24 1/2", with a 1 7/8" width across at the nut. There were several top cracks repaired, and several braces reglued. The finish shows age but is original, and there are nicks and dings from use and age. The 10-string produces a pleasing sound. It has the ladder-brace tone, and produces a clear sound with the single strings, while the octave strings piano chords. A very unique sound.